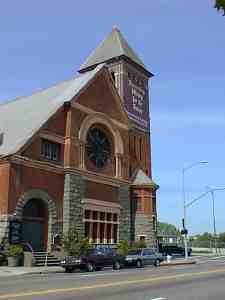 Designed in 1889 by Walter J. Mathews, this solid masonry Romanesque church departed radically from California's traditional Gothic wood frame construction. 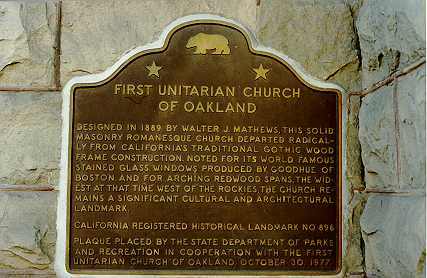 Noted for its world famous stained glass windows produced by Goodhue of Boston and for arching redwood spans, the widest at that time west of the Rockies, the church remains a significant cultural and architectural landmark. 685 14th St at Castro St, Oakland.